This option is only for customers who have approved custom logo submissions and were given unique codes from allheart. To submit a custom logo and receive your logo code, please visit our Group Sales Page. By clicking ADD TO CART, you agree to these terms. Embroidery preview is meant as a sample only. Note embroidered items are not returnable unless there is a defect or embroidery error. Please review selections for accuracy. This sporty and flattering scrub set from Wonderwink Origins collection features a V-neck scrub top and drawstring scrub pants with lots of fun details. Inseam: petite: 28", regular: 31", tall: 33"
Was so excited about getting this set. Color is perfect. There is no stretch. I’m 4’11” and I weigh 121 pounds if I can 3 pounds there’s no way I can get in this set. The pants are very long for a short person. I’m 5’1 and my pants are dragging on the floor. Also, the top is very hard to get into. My arm are always sucked. I first ordered these scrubs in a medium, my normal size in a junior fit scrub, and the bottoms fit incredibly tight. So I returned the mediums for a large and I can't keep my bottoms up. Huge size difference between medium and large. I won't be buying this brand in the future due to sizing. I, like others who posted a review, used the size chart. The set was way too large. Returned them for a smaller set. I like the set thought\. Love the material, did not like too much the candy pink(I tought it was lighter). Tops are too long, they covered my hips. But this junior fit tricks me. Right now I have 3 medium tops that I cannot use because too tight on my arms. But 2 of them fit. So I decided to order another 5 uniforms but with a large top. Feel too big, not slim on the sides at all. Trying to get use to them but probably will ditch them with the medium ones that don't fit either. Dissappointed. I think it is time to find a new brand. I reordered because they are easy to wash by hand and dry easily -- plenty experience with Hurracaine Maria - Puerto Rico. According to the size chart the scrubs I ordered should have been more fitted like in the photo. I measured several times to be sure and picked the size that coordinated to my measurements. The scrubs are too big. I wanted them to fit like in the photo but not even close. But i can wear them and I needed them for work so I’ll keep them. I just won’t order this brand again. Probably best to buy scrubs in person to be able try them on. Lots of pockets and water resistance is a plus. I love the scrubs but the sizing chart was off. I cannot return them due to I got my name put on the tops and purchased as a set. Love the colors and how they are made. Disappointed that I could not exchange. Bought these for the first time. Tougher material and doesn’t really soften up in the wash but durable! Lots of pockets. Love this set! Just wish I had ordered a petite top I am only 5"2' and the regular size fits me just a little long. I am pretty sure I have purchased these scrubs previously from Allheart, which I own in a size L (given the "junior fit", that works well for me; I wear a Med in their Missy Fit items). I ordered another set of scrubs, again in a size L, and was very confused when they were way too big, much bigger than the existing pair of scrubs I have that are also a Large. Are they not actually Jr. Fit? Not sure what happened, but it makes me nervous about ordering another pair based on the conflicting experience. I love Igaunaamed scrubs, which I think have been discontinued, so my next go-to brand has become Wonderwink for quality. When I ironed these Wonderwink scrubs, it turned shiny which I think means there is a higher polyester content (versus higher cotton content). :( If I use a lower iron setting, the wrinkles don't come out. When I first got this and tried it on all was good. It was when I actually work it to work that I noticed I was adjusting my pants A LOT. I ordered an XS, I am small framed but I've got a little bit of love handles...that was the only area where I was uncomfortable and mostly when sitting as they would go down my lower backside more than they should have (exposing an area that no one wants seen!). For this particular set I should have ordered a SM, as I needed more room in the waistline. The top was fine, just the issue with the pants. Love the style. The size chart on this site is off. Order a size smaller than what you normally wear. Heavy duty material. Kind of stiff. Size ran true to size chart. Shipping was as expected and had no delays! I like it a lot, my only complain is the top arm is a little big on me. I am returning it to exchange to a smaller size. Extra small petite is a perfect fit for me at 62 inches and 100 pounds. Very functional with the various pockets. I received compliments on the professional look and style of the Navy scrub set. The pants have a much wider flare at the bottom than I am used to but does not interfere with walking. IT is a nice scrub. This scrub is nice, comfortable and good quality for the price. The only problem is that I am very petite: 4'11" 94 lbs and the xs petite was still a bit big for me. I can still wear it (I have to the get pants fixed). If you are not as small as I am you will probably have no problems, but remember it runs a bit big. All my orders from Allheart have been great. Ships right away. Embroidery was great. Never had to return anything. The Wonderwinks are exactly as advertised. Prices are best reason I order here. I recommend this site at least once a month to coworkers. Bought these a year ago in royal blue, true to size didn't shrink and never got fuz balls between the legs. I wash and dry these regularly. Held up! I usually wear a large but these seems to run on the small size. I brought an extra pair of pants with me in case the unthinkable happened. 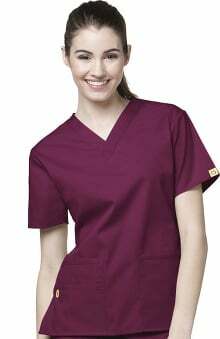 Cute scrubs, good quality and good price. Just disappointed they didn't fit better. I LOVE Wonder Winks. I do not buy any other brand anymore. They are the best scrubs you can buy! I usually do not purchase my uniforms online. I am very pleased with the way this scrub set fit, and the price was great. I ended up buying five scrubs sets. Love the scrubs. They are a good fit and a great deal! Will order them again. I love the wonder wink set I ordered! They are very comfortable and low maintenance. Easy to wash, dry, and iron. The only thing I don't like about them, is the pants are a little long. But, I am short so it is understandable. They are very comfortable to work in. I got two sets in two different colors. I got a blue and lime and both fit just like I hoped and I love them. Only issue is the blue the top is more faded than the bottom. I am probably the only one who can tell, but still. Other than that, love em! I love this scrub set. It fits great, looks great, and was a great price. I love my sets only thing is the small top is a little big and you don't have the option of choosing a xsmall! I started a new job and needed eggplant scrubs. I did accidentally order the wrong size and had to exchange. It took about a total of 2 weeks just to exchange. If I knew that I would of just returned and reorder because it would of been faster. I do overall like the product. Exactly what I ordered. Great quality! Was sceptical about ordering off this website but, figured I'd just bite the bullet and order the scrubs. Ordered 3 sets and they were perfect! From the embroidery to the cloth quality. I had to hem the pant legs as it was a tad long but not a bother at all. Plan to order another 3 sets!! Once I can save enough for the international postage!! Comfortable and true to size. I was weary about buying a set-not knowing if it would be a good fit--but it is great!!!! I've tried other Wonder Wink products, mostly cotton blend from the WonderFlex collection. I am not a big fan of polyester since they tend to be thicker and uncomfortable. Since I love this brand I decided to give these a try and I am glad I did because this set is now one of my favorites. They are very breathable and flexible, as well as comfortable. I am on the petite side with a height of 5'2" and 110lbs. The XSP fit very good and compliment my figure. Whether small or bigger, I am sure these scrubs will complement your figure. I will definitely be ordering more. These are by far my favorite scrubs. They fit great and wash well. The price cannot be beaten for the quality of the product. I own 4 sets and will definitely be buying more. Very nice Scrub Set, especially for the price! I got an XS top and XS Tall pants. I got the purple and the navy blue sets. The purple pants are shorter than the navy ones even though they are the same size. They work, but it was a bit disappointing. Other that that, the scrubs are a little rough for the fabric but they hold up well and they fit really well. I order the sets. I need the petite small pants, which fit perfect, but it'd be nice to have the option to get a different size top, if I chose. The petite extra small fits, but it could be a size larger and still fit perfect. Other than that, I love my winks! I tried these because of the price. The fabric is a little on the "thick" side, but they are a million times better than the awful scrubs provided at my job. I'm 5'5" about 120# I ordered the XS and the fit was perfect. In my opinion, these are the best scrubs you can buy for the money. Fit and look fantastic like more expensive sets. Very feminine, but functional and hold up well. Love, love them. I am very pleased with this scrub set and the price makes it even better. It comes in very cute colors. The set runs a little big, but in the end, it fits, wears and washes beautifully. I would recommend this set to all customers. I like the fit & they have petite size just right. These scrubs are made very well and really comfortable. True to size and the wear lasts a long time! Not as soft as others, but I prefer to look crisp and professional. Looks great, fits well. I like that the top flairs slightly as the bottom to accommodate a woman's form. I have gotten so many compliments with my new scrubs. 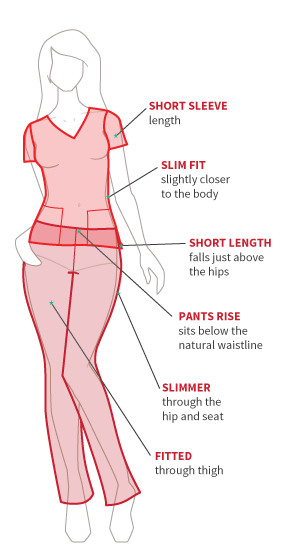 They are true to size and fit great if you are slim or curvy. Great quality of material, very durable. BEST SCRUBS EVER!! I wish I could wear all the different colors instead of just one. 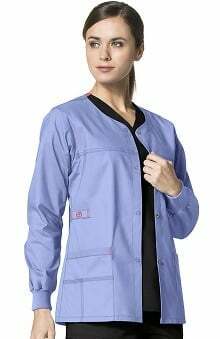 I bought 3 sets of the ceil blue scrubs, and I really liked the look and color of the scrubs. The material felt like a sturdy material, but the quality of the stitching was poor. Within one week of wear, the stitching for one top's left picket accessory loop and one bottom's cargo pocket already came loose. The quality of the Scrubs are great; however, the xs pants do not fit. I will be exchanging for a junior fit. I am 4'11 and weigh 106 lbs. This is my favorite set. Perfect fit, Allheart size chart is precise and if you want a very comfortable scrub this is one of the best options yo will find. 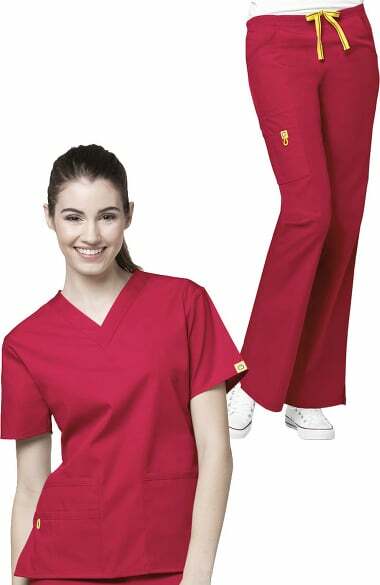 best scrubs ever, i have 6 sets now and love the quality, color, and the fit.i will continue to order, and refer people to allheart. This is the first scrub set I have found that offers petite pants. The material is great, sized correctly and is the perfect length. I ordered XSP. It's a great fit. Very durable and a steal for the price. The scrub set is comfortable to wear.The pants little too long cuz I'm 5'1.The cost is cheaper than other scrub set.I luv it. To say the least, this set is beautiful, and well made of the finest material. The fit is true to size. I purchased it for my daughter who is a massage therapist in training. She is 5'9, and the large size gives her the flexibility she wants. Very nice, indeed. i am tall and was hesitant on purchasing the tall set. i bought it on Monday and received it 5 days later. tried it on and it fits amazing. will def purchases probably every color except white and black. thank you. please keep these just the way they are. in combo set and at that price. I love love this set, it's comfortable in the sense that it moves with you when you walk, no restriction whatsoever. I ordered MedP.The fit is good. The fabric is of good quality. It doesn't wrinkle much after the wash and dry. The colors are vibrant (i got green, blue and purple). I got nice compliments from my colleagues. I'm happy with these. Thanks it arrived in a timely manner and fit perfectly. Fits well. Fabric is good for the price. Length is perfect for shot/petite. What a great deal for a great quality scrub. Hope this combo stays as an option to purchase. Typically my uniforms in the past (not yours), have never fit. I have expected that this was the norm. Much to my surprise, your uniforms " FIT ". I now enjoy wearing my new uniforms. They make me feel great. Thank you, and rest assured, I will be ordering from you in the future. I had high expectations for these scrubs. I am 5'7, 120# and ordered an XS top and XST pants. The top fits well, a little shorter than expected, but not unacceptable. The pants are like balloons! I've tried them on with shoes, tried to pull the drawstring as tight as possible, but to no avail I still look ridiculous in them. Nothing can really fix the massive amount of extra room in the legs. These DO NOT run small as far as I can tell. Will likely be returning, shame because I like the material and the brand. Is very comfortable and great material. Looks professional at a low cost! Very comfortable. The pants are a little too long. I really love these scrub set. They are so comfortable and I get compliments all of the time. I just only wish they make them in petite, because they are a little to long. I bought these for school. I'm 5'3 and ordered this set in XS. The pants fit really nicely and are narrow but very comfortable. I didn't bother ordering petite because after I washed them they shrunk a little and fit perfectly. The top however is a bit bigger than what I was expecting, but it still looks good, but it could have been a bit smaller and shorter...even after putting it in the dryer it did not shrink much...so if you are looking for a set of soft scrubs that looks good and maintains its size and shape I definitely recommend these scrubs. I really love these uniforms. Make you look very professional and comfortable. The only issue I have is you have to order a size bigger because they do run small. Petite Inseam is approximately 28"